First Line: In late summer Line told him she was two months along. It's been a long, hard winter for the homesteaders in 1850s Nebraska. Four women's hearts and minds have been broken by bitter hardship. This isn't a new problem, but the area has no asylum. The traveling preacher puts in motion the plan that worked so well the year before: a homesman must be chosen from among the women's husbands to take them back to Iowa where they will then be sent on to their families to be cared for either at home or in asylums. The rest of the husbands will provide a wagon, team, and provisions. When the husbands draw straws to see which one will be the homesman, the one with the short straw refuses to go, and in steps a remarkable woman. Mary Bee Cuddy, an unmarried homesteader with a well-run farm, commits to the task. As strong and as brave as she is, Mary Bee realizes that she will not be able to do this alone-- but the only person she can find to accompany her is a no-account claim jumper named George Briggs. Mary Bee, Briggs, and the four helpless women set out on a journey that will take at least six weeks, traveling against the tide of settlers, Indian attacks and treacherous weather. Normally I'm not what's known as a "cover junkie," but the cover of The Homesman showing a lone sod house in endless waves of prairie grass under an eternity of sky grabbed me. When I read the synopsis, I knew I had a purchase to make. Decades ago I remember coming across a comment in a history book which stated that women in those "soddies" out on the Great Plains had been known to go insane just from loneliness and the ceaseless keening of the wind. That was all that was said, but those words stuck in my mind like a burr. Now here was a novel in which the story of these lost voices could be heard. Author Glendon Swarthout was always more interested in the losers in the Old West. What happened to them? What were their stories? In doing research, he didn't find much about what was done about people who were mentally ill, and what he did find was about the men-- who were likely to die of exposure or disease, to become alcoholics, or even to be shot down like rabid dogs in some out-of-the-way corner. But what happened to the women? Even back in the 1850s you couldn't just shoot a woman. The Homesman is Swarthout's solution, and it is spare, poetic, and brutally honest. Superficially it is the simple tale of a man and a woman taking four helpless women cross country in a wagon to get them the sort care that they need. But the troubles Mary Bee and Briggs encounter on the trail, the people they meet, and just their close proximity to each other, begin to change them in subtle ways. This book is heartbreaking, it is brutal, and it is shocking. It tells a tale that many readers aren't particularly going to want to read, and perhaps that's the exact reason why they should read it. This is a story about the losers, those who were completely lost to history. The reasons why these beleaguered people failed were never going to be pretty or cheerful, but they should be remembered. As I read, I began to feel cheated that the four women being taken back to Iowa didn't have any real dialogue or interaction with the others. Then I just had to shake my head at my own foolishness. The four women in The Homesman had been bludgeoned past caring by work with no end, by giving birth to one baby after another, by the brutal vagaries of the weather, and often by cruelty from their own husbands. These women had completely given up; they had been reduced to things that needed to be moved from Point A to Point B. No, it's Mary Bee and Briggs who carry the load of thinking and conversation and action, and even their stories don't go as most readers would like. But as shocking as their tales may be, Swarthout plants clues all along the trail for us to notice. I was completely under this book's spell, and even though I didn't like how everything turned out, I still loved it. Now I'm looking forward to how Hollywood treats a very un-Hollywood novel. It will be interesting. Yes, I read those after I'd written and scheduled this review. I have a tendency to do that with a book I loved, just to see how "the other half thinks." I was correct in assuming that some wouldn't like it because it doesn't have a happy ending. 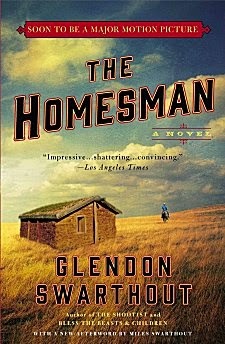 Like you, I normally don't read books published that long ago, but I'm certainly glad I made an exception for The Homesman. I look forward to your own thoughts on this book, Ken. Cathy - Oh, this does sound like a fantastic novel. Lots of atmosphere, lots of good history and gut-level stories too. I can see why you got caught up in it. And I love that cover as well. I am soooo glad I noticed this book sitting on a shelf at The Poisoned Pen! I like the cover, but right now reading about the oppression of women just isn't what I want to read, with all of the news about women trapped in abusive relationships. It's just too real at this point. Am glad you liked it and hope others do, too. Really! I say this as book piles crash to the floor. And I fear looking at the TBR list, to which I keep adding. This is all the fault of good global dvds of TV episodes. Have seen Welsh, English, Swedish and Italian TV programs by the dozens in the last three months. Reading suffers, but these programs are so good. Sounds on par with what I do in the evenings while Denis is at work. I do needlepoint and watch lots of mysteries from around the world. This week, though, I've been watching Ken Burns' "The Roosevelts."